HIGH SECURITY Level 6 P-7 Cross Cut 40 L Professional Touch Screen Shredder for small Office use with continuous duty motor and heavy duty chain drive with steel gears. 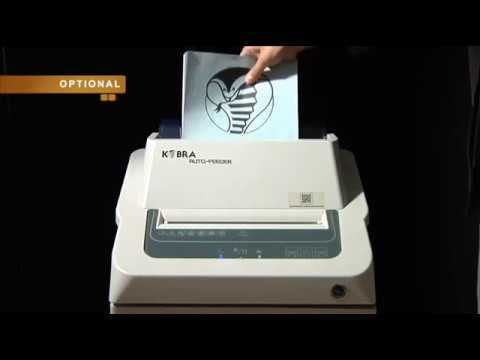 The KOBRA 245 TS HS-6 is a High Security 0.8x5mm Crypto Cut shredder that comes with a 245mm wide entry throat and is suitable to shred Classified, Top Secret and Crypto documents for lower volume users meeting the UK Governments Highest Security Requirements. Designed for Commercial, Military and Government use, the KOBRA 245 TS HS is available in security Level P-7 and features a touch screen, which activates all of the machine functions. For the shredding of transparent materials like acetate and microform simply keep your finger on the Forward control for 5 seconds and the machine will run for 30 seconds. Approved by many International Governments and Military Bodies, the KOBRA 245 TS HS-6 is also being used by the US Department of State, the CIA, the National Security Agency and by the members of the G8 Summits. A special cutting system can shred an A4 sheet in about 10,000 particles which becomes absolutely unreadable, even if special electronic optical microscopes are used. The KOBRA 245 TS HS-6 machine is equipped with an environmentally friendly Energy smart system™ meaning that the shredder goes into standby mode after 8 seconds of not being used and is restarted by inserting material into the machine. The model automatically disconnects from the mains power supply after being idle for 4 hours. The KOBRA 245 TS HS-6 shredder has 24 hour continuous duty motors, an automatic Start/Stop function, a stand-by function which cuts all power to the unit, a heavy duty chain drive with steel gears and are 100% jam proof. This model will automatically stop when the collection bag is full or the door is opened and will display a light to show which has occurred. The cabinet is also mounted on casters for ease of movement around the office. The use of a P-7 shredder such as the 245 TS HS-6 will aid your GDPR compliance.